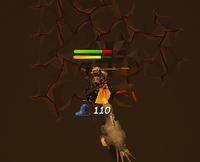 The Fight Kiln is a sequel to the TzHaar Fight Cave minigame. New additions to the fight such as the use of familiars, new enemies, and lava crystals , which have different and useful fights. This causes a much different fight compared to the Fight Cave. What is new in Fight Kiln compared to Fight Cave? Creatures are stronger and are much harder to hit if you don’t attack against their weakness. Also new is the TokHaar-Ket-Dill (if you did the quest TokTz-Ket-Dill, you will be familiar with this enemy) and a new boss Har-Aken . In addition, there are 7 Jads throughout the Fight Kiln which can hit much harder if you don’t pray correctly, but these Jads have much lower health and do not spawn any healers . The Fight Kiln also does not follow any specific pattern to how the enemies will spawn like the Fight Cave does (i.e. Fight Cave waves 1-3 are a 1) lvl 22, 2) lvl 22 + lvl 22, 3) lvl 22 + lvl 22= lvl 45) as well as only being 37 waves compared to 63 waves, but don’t let this deceive you that it may be quicker/easier. These are “power-ups” that will appear at the end of every other wave starting with wave 1. The crystals always appear to the south of the little rock in the center of the arena. Crystals do stack on each other. The only worthwhile crystals to use when you attempt the Fight Kiln are the Invulnerability, Restoration, and Constitution as the other crystals take up inventory space and can be potentially harmful. It is recommended (but not necessary) to bring all 3 ( 2 minimum) styles of combat to the Fight Kiln, making hybrid armor invaluable. *Obsidian armor requires completion of the quest ‘Brink of Extinction,’ which requires 80 smithing as well as spending time in the Fight Cauldron gathering obsidian shards and requires 85 smithing to make the armor set (can be assisted). 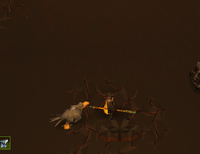 However, full obsidian (excluding shield) will reduce all damage in the TzHaar area by 45%. Note: If you don’t have hybrid armor, bring the best armor for each style and use a platebody/platelegs switch. Best weapon possible for each style, but 2 handed weapons are better than dual wield if it’s the same tier since it saves inventory space. Not including T90 weapons as this geared to lower levels and cost is considered. It is recommended to have at least T75+ weapons to complete the Fight Kiln. *Although the Sara Godsword is the weakest recommended weapon, it can prove to be the most useful melee weapon for the Fight Kiln. Due to the weapons special attack, which heals and restores prayer points, it can save multiple inventory spaces filled by prayer pots and it saves on food. *Ring: As a reward for completing The Elder Kiln, you receive a Tokkul-Zo, a hybrid ring that does 10% extra damage to TzHaar, lava, and obsidian creatues. 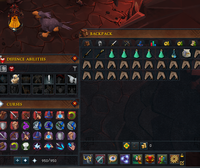 This ring is highly recommended to use, however it does degrade (4000 hits on TzHaar or obsidian creatures). If you run out of Tokkul to recharge your ring, then use the best hybrid ring you have. Aura: Aura isn’t needed, but it helps. 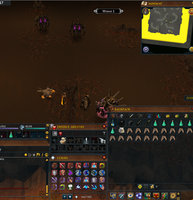 If you aren’t using a Sara Godsword use the Penance aura, else use the Vampyrism aura. Hide behind the L shaped rock in the southern part of the arena. Kill the creatures in front of you 1 at a time by simply moving one square to the left. Once the creatures in front of you are dead, finish off the enemies to the east and then to the west. *At the end of wave 1, pick up the Invulnerability Crystal south of the rock in the center of the arena. Also pick up Restoration Crystal at the end of wave 3. 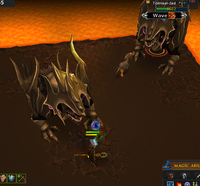 This Wave you will want to start to the east of the L shaped rock that is used as a safe-spot, build up adrenaline on the ranger, then when you are ready to face Jad run west having either protect range or mage. Threshold abilities such as asphyxiate for mage and rapid fire for range are effective in damaging Jad as well as deflect curses if you have them. The TokHaar Jad only has 7900 hitpoints and does not summon healers, but if he lands an attack it can hit much higher than the Fight Cave Jad (over 10000 hp!) . Use protect from range if Jad slams the ground and protect from mage if Jad raises its entire body. Same concept as waves 1-4 and 5-9, hide behind the L shaped rock to the south. Wave 19: Similar to wave 5, finish off all the enemies then deal with the TokHaar-Ket-Dill using Hit and run tactics. Wave 20, Jad #2 (spawns in southwest corner) Move to the southeast corner again (east of the L shaped rock) and kill the Ket-Zet, then proceed to the west and kill another Jad. A second cut scene will occur after Jad is defeated. The L shaped rock to the south is gone now so move to the north of the center rock. Your priorities will be to kill anything to the northeast and northwest of you as you will be safe from melee creatures and sometimes mages/rangers to the south. Wave 30: Jad again?!? (Spawns in southwest corner) Make sure you are ready to prayer switch immediately at the start of this wave (unless a invulnerability crystal is used), stay on the north side of the rock, but on the square to the east behind this rock as it can cause Jad to not attack you until you run out. However don’t rely on this 100% just to be sure so always be prepared to pray. Stay to the north of the rock and defeat all the enemies, pretty straightforward. Wave 34: The return of Jad (spawns in southeast corner) Stand to on the western square behind the center rock to the north (still be prepared to pray switch in case Jad attacks), if Jad does not start attacking right away, kill the melee creature that will be right next to you, then Jad, and finally the ranger. (when using the invulnerability crystal it is still advised to pray switch in case you don’t notice the chat box saying the effect ended.) After Jad is defeated, finish off the other creatures however you like then pick up the constitution crystal. Wave 36: You’re kidding, right? (2 Jads in southwest and southeast corner) Nope...Two Jads spawn on this wave! Use a Constitution crystal so you cannot get 1 hit by the Jads because of the health boost. Use an invulnerability crystal for precaution and stand on the eastern square behing the center rock to the north. 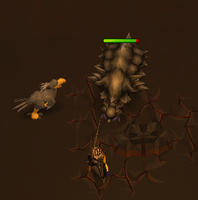 The purpose of the invulnerability crystal is either A) Kill one quick enough to not be attacked by both after the crystal effect ends or B) Make sure that only one Jad is attacking at a time, move around a little to find a spot where you can attack one at a time. What makes this boss unique is that Har-Aken itself does not attack you, rather tentacles of magic and range combat styles will attack you. Har-Aken is also not always present. Har-Aken will be submerged in the lava for a little over a minute then rise up either on the west, south, or east side of the arena for about 30 seconds.